It's another sad box office weekend. The Avengers are coming to save us all, I swear. 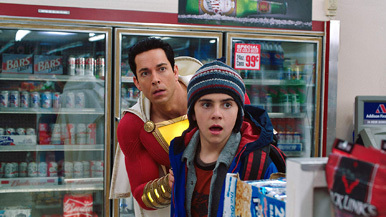 Our top movie of the weekend will once again be Shazam!, the charming DC film that overperformed last weekend in terms of box office, critical reviews, and audience reaction. Even with all that good news, Shazam! still dropped heavily yesterday, with $6.4 million earned and a 69 percent decline. I think it'll likely have about a $23 million weekend, maybe a bit less. It's currently the family film of choice and should have one more weekend of ownership of that audience until we all choose Marvel instead. Second place goes not to Hellboy, but instead to Little. That's right. Little is our second place film for Friday. Featuring Regina Hall and Marsai Martin from black-ish, A Big-inspired film (not to be confused with last weekend's Big-inspired superhero film), Little earned a solid $5.4 million yesterday and should finish with about $15 million. Since this movie had a reported $20 million budget, there's nothing wrong with that. Hellboy, on the other hand, isn't going to be making anyone at Lionsgate happy. It was absolutely decimated by critics, who call it immature, gross, and gory. Also, just changing out the guy who plays the title character probably isn't enough of a reason for a reboot. It's a shame, because I love David Harbour and Ian McShane, but Hellboy made just $4.9 million yesterday and will probably manage just $13.2 million for the weekend. Given the 15 percent rating at Rotten Tomatoes and the C Cinemascore, it won't hang around long, either.